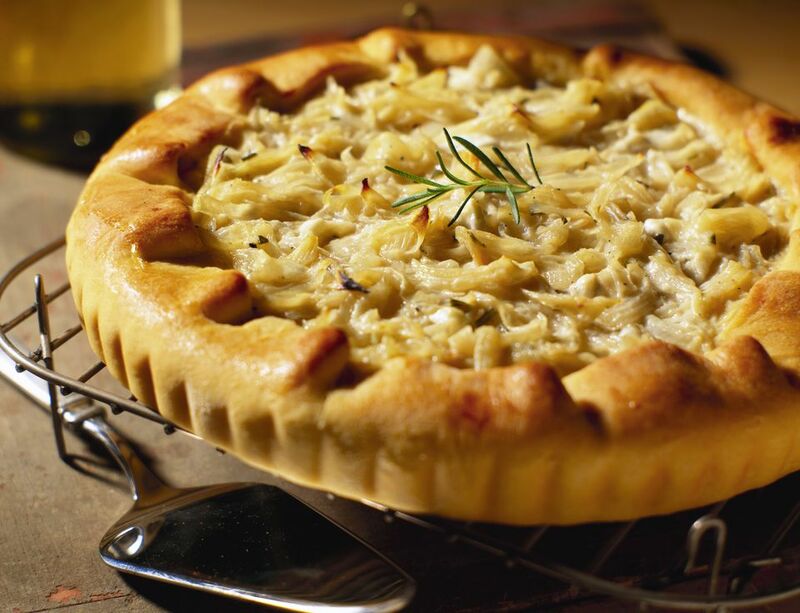 This savory German Onion Pie or Zwiebelkuchen met Hefeteig is stuffed with gorgeous caramelized onions and is a wonderful fall or cold weather dish. The main filling ingredient is onions, as well as suggested optional additions of caraway and/or bacon. This pie differs from quiche because it is baked within a yeast dough, like pizza. This dough and onion combination is particularly flavorful because the lean dough becomes crispy in the oven and does not overwhelm the toppings. This crispy, flavorful recipe will quickly become a family favorite. Start by making the dough. Some prefer mixing instant yeast and salt into the flour and then adding the warm water and mixing until a smooth dough forms, but make it the way you like best. The Germans often start it by crumbling the yeast into a depression in the flour, adding the liquid and lightly mixing, sprinkling with flour and proofing the yeast that way. You can also proof the yeast separately by dissolving in the lukewarm water with a pinch of sugar. It takes 10-20 minutes for bubbles to form. After the dough is smooth and elastic, form it into a ball, oil the surface and let it rise in a bowl covered with a clean dishcloth in a warm place until doubled, about 1 hour. While dough is rising, make the onion filling. Chop the onions vertically or in smaller pieces if you prefer. Heat two tablespoons of the oil and the tablespoon of unsalted butter in a large pan, add the onions and sauté over medium heat, adding oil as necessary to coat all onions. Sprinkle the sugar over the top. Cook for about 20 minutes or so. Remove from heat after the onions have browned and caramelized. Note: You may also start with 4 slices of bacon, cubed and browned. Remove bacon and add onions to bacon fat. Do not add as much salt to the final dish. Mix the creams, salt, and eggs to form a custard base. You can add freshly ground nutmeg or pepper to the mix if you wish. Press the dough into an 11-inch, buttered springform pan or into a buttered 11 x 13-inch baking dish, being sure to form high sides. Distribute the onions over the dough. Sprinkle with caraway and cooked bacon. Pour the custard over the top and tilt to distribute evenly. Place in the oven and bake for 40 minutes or until custard is set and yeast dough is browned. Take an idea from a popular pizza chain and finish the thick crust with butter and honey after eating the filling.